Tale's of Michelle: "You are So Handsome"
I really am beginning to have a slight Magnolia addiction. This Edwin stamp "Edwin wants a Hug" is just too cute! The paper I used is double sided paper from My Minds Eye - Breeze "Boyish" Handsome. 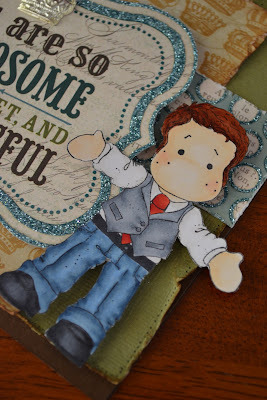 The cardstock is Bazzil which I have distressed and inked with "vintage photo" distress ink. How does everyone else distress their cardstock? I use my metal ruler to roughen up the edges. I feel it gives it a nice non-uniform look. I just love the blue glitter. The crown is a brad from Delish Designs "mulberry crown". These have been sitting in my craft stash for years. Edwin is coloured with Copics E50, E51, R20, T1, C3, C5, C7, B21, B93, B97, R27, R29, E13, E15 and E17. ADORABLE card! Edward never looked so good! Love the distressed edges and your coloring is FAB! Super card, and so glad you played along with us at CC&CC. Aloha, Joanne. Oh I love your Edwin card! Great sentiment! Hi Michelle, love your project, so original! Thanks for joining us at Deep Ocean this fortnight, hope to see your lovely works again!